Here we have the first appearance of Harley Quinn. She has become a hugely popular, fan favorite character and is often cosplayed at conventions around the country. Some are really good, and some, not so good. I challenge you, next time you go to a con, to try and count all the Harley Quinn outfits you see. Batman Adventures #12 is Harley Quinn's first appearance in comics, but it isn't her actual first appearance. Her actual first appearance is in the cartoon "Batman The Animated Series", in the episode titled "Joker's Favor" that aired in 1992. The Batman Adventures comic series is based off of this cartoon and isn't considered to be a part of the Batman comic book universe, or "cannon". What that means is anything that happens in the Batman Adventures comics, isn't recognized in the Batman or Detective Comics series. For example, if Batman had an arm or leg cut off in Batman Adventures, he would still have them in all of the other Batman titles, because the stories are not in the same universe and are in no way related. 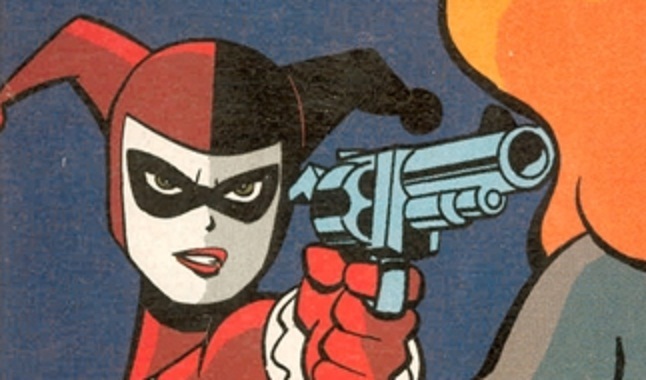 CGC labels it as "1st appearance of Harley Quinn in comics (out of DC continuity)". Harley Quinzel first met the Joker when she was an intern at Arkham Asylum. She soon fell in love with the Clown Prince of Crime, and a little bit of his crazy wore off onto her. Then, she dropped the "zel", added another "n" and became Harley Quinn. She often accompanies the Joker, and is an accomplice to many of his crimes. None of this happens in this comic though. In this issue, Harley, Poison Ivy and Catwoman crash a costume party that Batgirl happens to be at. In the end, Batgirl saves her friend from being kidnapped by Harley Quinn and Poison Ivy, and also stops Catwoman from stealing the precious Surh Diamond that was on display at the museum. All's well that ends well. Even though this is a Modern Age comic, it isn't cheap. I'm not sure what the print run of this comic is, but I've seen estimates from 40,000 to 60,000 copies. If these numbers are correct, then this is a fairly low run, considering that some comics printed during this time reached to over a million copies. I'm not saying that this comic is scarce, because it's not. I'm just saying that compared to other comics printed around this time, Batman Adventures #12 has a much lower print run. Whatever the actual print run is, CGC has 2,248 copies listed in there census so far. Most of them are high grade too. So far, the highest grade registered on the census is a 9.8, but there are 433 copies with that grade. When we go down to 9.6 graded copies, there are 615 listed. That's a total of 1,048 9.8 and 9.6 CGC copies total, almost half of the total copies graded by them to date. 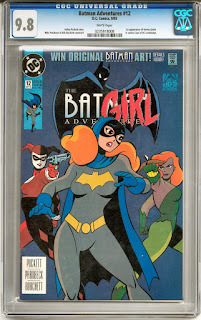 So, regardless of how many copies were actually printed, you won't have any problems finding high grade CGC or CBCS graded copies of Batman Adventures #12 out there. Finding a copy that's in your price range may be a different story though. The average value for 9.8 copies of Batman Adventures #12 over the last two years is a hair under $1,500. Considering that this is one of the most popular books from that time, it doesn't surprise me one bit. The latest eBay sale of a CGC 9.8 copy recently sold for $1,800, and the latest CBCS copy sold for $1,625 on March 29th. Even low to mid grade copies are selling for several hundred dollars. In Jan. of this year, a 5.0 copy sold for $250, and a lower grade 4.5 went for a penny under $200 in Dec. of last year. With the popularity of the character, and the fact that Harley Quinn is going to be featured in the new Suicide Squad movie, I don't see values for this comic going down anytime soon. If they go anywhere, it's gonna be up, way way up!